What make another blog better than mine? Why is that blog is considered a better blog than mine? What does it take to be considered one of the best blogs? What does the best blogs have that mine don’t have? These are the type of questions any serious blogger may be asking himself in a bid to make his blog one of the best blogs in his niche. One thing that bloggers do is spend most of their time on their blog, I think this is a mistake. Looking at other blogs both in and outside my niche has helped me to discover a lot of things. When I visit a good blog, I take some time to study the blog to see what it has that I don’t and why it is a better blog than mine. That way I have learnt a few things that have helped me improve my blog greatly and I want to share some of the things I have learnt in my course of studying all the good blogs I have come across. At the end of this article, I expect that you will learn a few things that will also help you improve your own blog to be considered among the best blogs in whatever niche you find yourself in. The niche doesn’t matter as this principle applies to every type of blog. Also learn to visit the best blogs in different niches in order to borrow ideas from them and improve your own blog. Great Content: The most common thing with all best blogs out there is content. The quality of their contents is the first thing you notice when you closely look at such blogs. To be considered among the best blogs in your niche, you must learn to churn out quality every time you hit the publish button. Develop a content plan for your blog, plan every topic carefully. Do not just hit the publish button just because you have to publish something for your readers to read. Take some time to plan every topic so you can have direction while writing, this helps flow in writing and both search engines and humans love free flowing and natural type of writing. You also need to diversify on your content types; you must not limit your contents to just texts alone, try video posts, podcasts and even Infographics. All best blogs out there do this from time to time so why shouldn’t you? Goals: What are your blogging goals? What do you intend to achieve in blogging? How have you met your expectations since you started blogging? Learn to set both short term and long term goals for your blog. Ensure they are realistic goals and see that you achieve them. Every good blog out there has a goal and achieving such goals help in promoting them. So set your blogging goals and see that you achieve them, that way you will promote your blog to be one of the best blogs in your niche. Reliable hosting & Good Blog design: You can’t be the best when you don’t have the best. To be considered one of the best blogs, you must host your blog on a good and reliable web server. This will make your blog fast to loading and improve your user experience. You do not expect a slow loading blog to be considered good. You also need a responsive design for your blog or at least a good mobile site in its place. You do not want to lose out on the mobile traffic or deny your mobile visitors the chance to read your quality contents. So ensure to build a blog that will serve your audience no matter the device they are visiting with and also ensure a good design as I specified in this article titled “Importance of Blog Design and Layout – Things You Should Know”. A voice: You don’t have to sound like a robot in your blog posts, ensure to add your voice to your blog post. Every best blogs write from experiences, write your own stories or add some personal flavor to your writing, personalize your writing, use first person pronoun (I) a lot in your writings. Make sure your voice is heard in all your posts, this will not only earn you trust from your readers, it will also earn you respect among other bloggers in same niche. Good Understanding of SEO: Another thing every good blog out there have is good understanding of search engine optimization SEO. You can’t be the best with just a little/basic knowledge of SEO, you need to learn advanced SEO strategies that will take your blog to a higher level than it is already. If you are at the level you are in blogging now with just the basic knowledge of SEO you have, be sure you can climb a notch higher with a better understanding of SEO. Every best blogs out there knows this and applies it in their everyday existence, else why do you think they were consider the best at first? Social Media Presence: Have you ever checked up on the social media presence of the likes of Pat Flynn, Rand Fishkin, Darren Rowse, Andrew Sullivan etc? As busy as they are, they make time to build and maintain a strong social media presence because they understand the importance of social media in blogging. How have you maintained yours? To be considered among the best blogs in your niche, you have to stand out to be noticed and the tips shared here if well implemented can help you grow your blog and maybe one day soon be considered among the best blogs too. Do not limit yourself to what you can become; you have the potential to be recognized as one of the best bloggers. I have recently been listed as one of the “Top 25 Bloggers in Nigeria to watch out for in 2014” because I have taken time to study what makes the best blogs and have implemented the ideas on my blog and am being recognized for it already. Why shouldn’t you do same? Follow the guide and improve your blog. Tell me how you have gone about improving your blog to be one of the best blogs so far in the comments? Tell me your limitations, share your challenges with me and maybe we can find a solution together. To be considered the best, remember you have to be the best and to be the best you have to read from one of the best, so do not miss my next article, use the subscription form below to subscribe my RSS feed now. Great design is always intuitive and luring for our blog readers. It is a great way to reduce bounce rate. Great post Nwosu. I’d really worked hard to make my blog mobile friendly and for that I tried and tested with many of the available options. Dudamobile, WP Touch plugin and what not, but each had their own drawback. Some charged me money monthly to use my own domain name and some were not as stable as they should. Finally, I jumped to responsive theme. Now, I’m fine. Hope it welcomes every visitors equally. To be counted amongst the best blogs , good content is must which should be founded through search engines ..this requires good knowledge of SEO .Hence bloggers should be well equipped with the knowledge of SEO . thanks for sharing this insightful post nwosu. this can serve for bloggers like us as a guide in maintaining and promoting our blog so that they can be as great as those best blogs out there. 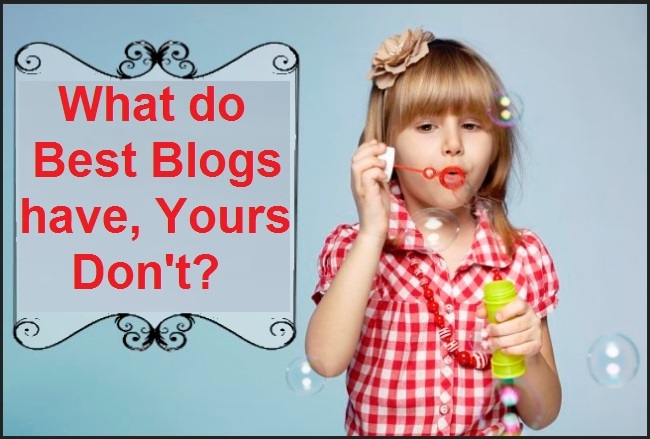 Yeah, sometimes I asked the questions to myself which you have listed in the beginning of this blog post and the sad thing is, I used to spend much time on my blog as you told. I will try to change that and will learn some worthy stuffs from other good blogs. Hope am taking care of all the points from great content to social presence, will improve those further more. Thanks for your suggestion of learning from other blog, keep writing the same kind of stuffs for your readers. If a blogger struggles to learn new blogging techniques, then it is hard for him/her to thrive in blogging – My personal suggestion. I always advise bloggers to always go for responsive designs as it will eliminate the need to design multiple sites for different screen resolutions. Thankns for your contribution Suresh. Thanks Niraj for your awesome contribution. Glad you liked it. I could’t agree less with you Pramod. Thanks for your awesome contribution. Thanks Nirmala for your wonderful comment, blogging is always evolving and as such we must be the best in all that is required to build a good blog. This is a great observation, comparing your blogging strategies with other blogs in your niche and outside your niche. The fact always remain that content is always the kinsmen of a successful blogger either now and then, what blog offers determine the outcome of every successful blog in the blog-o-sphere. My personal philosophy is ‘setting a definite and achievable goal make life a worth living’ for me, and this word I watch out for always and I will not let it go far from my memory. Nice nice bro. Mavtrevor, thanks for this wonderful post. I am glad for you and wish once again to congratulate you for making my list of the Top 25 bloggers in Nigeria. Yes hard work really pays, one way to develop oneself is to take a look at what one is doing well, the areas where one is performing badly and then improve where improvement is needed. You have worked hard and now it is yielding positive result. All the points you have listed are actually important in gaining popularity/recognition in the blogosphere, especially by delivering great content, having your own voice and maintaining a healthy social presence. Once you have these and then add some SEO, you are bound to go places in your blogging career. Thanks for being the first amongst the listed blogs to link back to me. You have also demonstrated one of the attributes of great bloggers -selflessness. If you keep up this attribute, it would surely help on the path to greatness. After publishing that list, some people made a case for my inclusion on the list; but I told them I should not be the one blowing my own trumpet, some other persons should do it for me. This is just the first path to recognition. I believe very soon some other people would see the need to recognize my blog and my person also. But I have to first recognize others; that is what makes for greatness. Thanks once again for linking back. God bless you real good. I wish you the very best in your blogging career. See you at the top soonest. Thanks Adesanmi for your worthy contribution. Thanks Joseph for your compliment and contribution. Selflessness is the first and most important quality for any real blogger out there. As a new blogger, I was confused in between the question that you have mentioned above. I am doing good now. Visiting to other good blogs and giving some time to those blog awe me lots of learning about good writing skill as well as getting good design. Having nice SEO is great thing but I give more preference to my readers. Social medias are strong tools to build relation so we have to maintain our presence over there very actively. Thanks Kumar Chandan for your worthy contribution, i am glad you found the post interesting. Do visit Netmediablog always. Bro you are good. point 1 & 2 really got me. with quality ,passion driven goal, one can actually attain lot in life. then relevant content is also an outstanding key in blogging. thanks for the update. Thanks i hope you will subscribe to my blog and read more. Thanks for your compliment and comment, do visit Netmediablog always. MJ you could’t be more correct, blogging is not a make-money-quick-scheme, it takes time but when you get it right, its totally worth doing. I have some disabling challenges. Besides Dragon, which my not understand my slurred speech, I really cannot see my mistakes until weeks later. I have intramuscular issues with my eyes and I can shake so I accidentally touch things I don’t plan. I really don’t want to let my post sit for a few weeks before I publish. This a problem. Huge. I have offered to pay the 13 year old grand kid to edit, but she’s not interested. Really? “Top 25 Bloggers in Nigeria to watch out for in 2014. Am sorry to hear so, maybe you can hire freelance writers to help you out and they do come cheap these days. Thanks for your comment on my blog.